Oil spill response planning in Oregon is the responsibility of both the Oregon Department of Environmental Quality (DEQ) and facilities that store, transport, or process large amounts of oil products. Vessels and facilities have their own plans for stopping spills before they can spread. Oregon DEQ regulates these facility plans and also develops plans for areas that contain many potential sources of oil spills or that are especially vulnerable to harm from oil spills. The Oregon Coast is one such area. In summer 2019, DEQ will release updated oil spill response plans for the Oregon coast with new strategies to contain and collect spilled oil and keep it away from sensitive natural, cultural, historic, and socioeconomic resources. Where possible, the new oil spill response plans for the coast will include strategies to protect rocky shore areas for the species that live there and the people who visit them. These plans will also include information for notifying resource managers and affected facilities when spills happen. 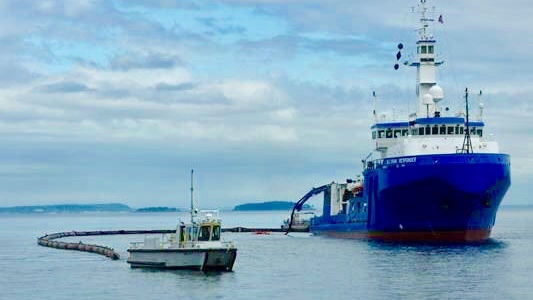 In the United States, marine debris is defined as “any persistent solid material that is manufactured or processed and directly or indirectly, intentionally or unintentionally, disposed of or abandoned into the marine environment or the Great Lakes.” Oregon State law defines marine debris similarly. Marine debris is a growing global problem that harms the environment and commerce, and threatens navigation safety and human health. In April 2014, Oregon began to experience a massive die-off of sea stars (Pisaster ochraceus) in near-shore environments. The cause of the depletion was named Sea Star Wasting Disease. This affliction was characterized by twisting arms, then deflation and/or lesions, lost arms, losing grip on substrate, and finally disintegration. A proximate cause of wasting was likely the “Sea Star associated Densovirus”, but the ultimate factors triggering the epidemic, if any, remain unclear. Although warm temperature has been proposed as a possible trigger, Sea Star Wasting Disease in Oregon populations increased with cool temperatures. Over 300 species of phytoplankton have been implicated in causing “red tides”. While most “red tides” are harmless, over 80 phytoplankton species may produce toxins that are harmful to humans and marine life. Harmful Algal Blooms (HABs) have been responsible for closures of shellfish and crab fisheries off the Oregon coast in recent years, resulting in negative social and economic impacts for coastal communities and across the state. In response, the state of Oregon and the National Oceanic and Atmospheric Association have been engaged in efforts to research and monitor the potential causes and extent of HABs to better understand the risks.